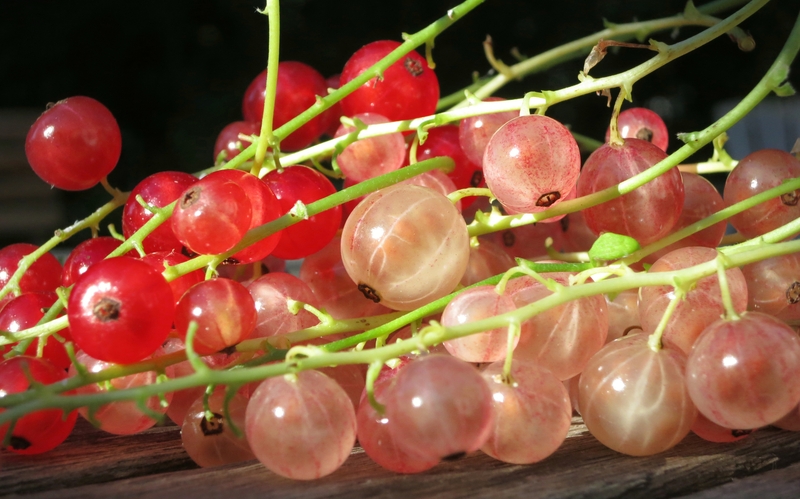 Gooseberries and currants…What an excellent addition to our eatscape! Ribes is a genus native to the Northern Hemisphere and includes the flowering shrubs of gooseberry and currant. There are some restrictions in some states regarding the planting of Ribes connected to their having been an intermediate host to White Pine Blister Rust. I was happy to find that Pennsylvania was not on any restriction list. I ordered and planted several varieties of gooseberries and currants. I obtained my collection over the past couple of years from Trees of Joy, Nourse Farms, and Fedco. Gooseberries and currants can be planted in sun to part-shade and seem to do well with very little attention. I’ve, also, discovered that the gooseberry plant is easy to propagate from cuttings. 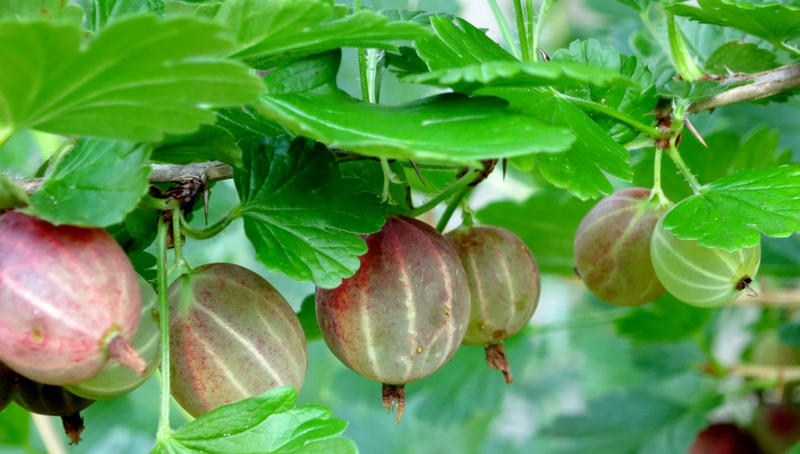 One thing you should know is that gooseberries have thorns. They are meat-tearing, thumb-puncturing thorns. I kind of like a little prickly-ness in the garden. It encourages care and respect. There is a variety of Ribes called Jostaberry. It is a thornless cross between currants and gooseberries. 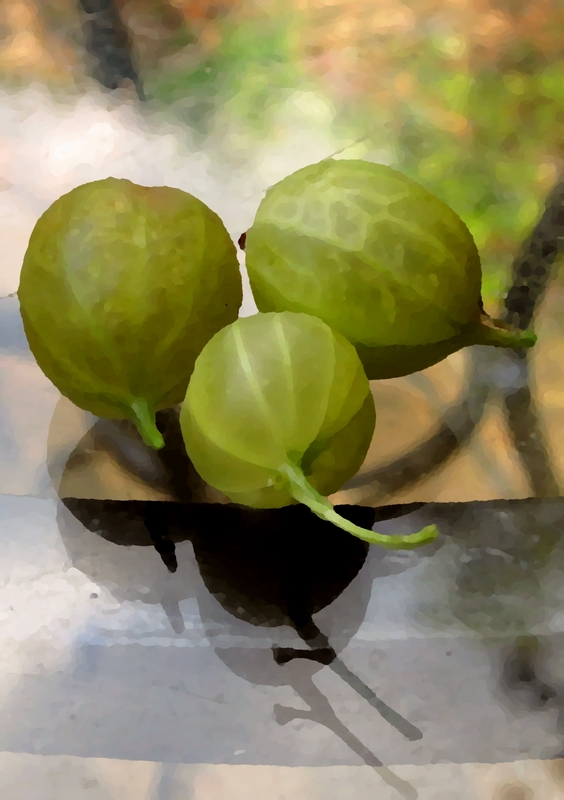 This is a Red Hinnomaki gooseberry. 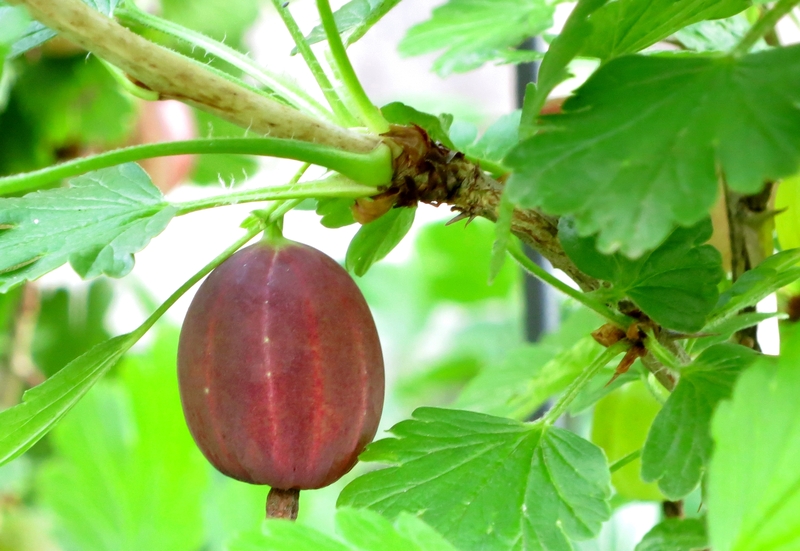 Once ripened to a purple-red color, they taste very good right from the plant. Above you can see a manipulated image of the large green Invicta gooseberries; tart and wonderful for cooking and baking. This is the first year that I’ve been able to harvest from these plants. I asked Sally (IMBY at Mistyhollow), “What do I do with them?” “Pie!” was the immediate and appropriate answer. I started out with a sourcream gooseberry pie which was pretty much instrumental in my falling in love with gooseberries. Then, I made a very simple jam from the green and, then, the red gooseberries. Wow! Good stuff on vanilla ice cream! I’m looking forward to having my new “Poorman” Gooseberry plants fruit next year. Poorman is another red variety reported as being good for fresh eating. The currants have been ripening into lustrous pearls on the shrubs for a couple of weeks or more. Though the flavor was rich and complex; they were a bit too tart for me and they had tough seeds. I let the birds take them as they wanted. After successful experimentation with gooseberries, though, I thought I’d harvest what the birds left behind and see what I could do with them. I simmered them on the stove with a little bit of water and sugar. I, then, pushed the stewed currants through a strainer to make a teasing tablespoon of gourmet sauce. I can’t wait until next year to harvest more of these. I’m, also, excited to see what the black currants will have to offer. They did not fruit this year since I just put them in the ground this spring. This entry was posted in Edible Landscaping, Uncategorized and tagged Blackcurrant, currants, Gooseberry, invicta, pink champagne currant, red hinnomaki, ribes, rovada currant. Bookmark the permalink. I want to eat some of your delicious scape. Great pictures. Ahhh..maybe we have to get you settled in with some gooseberries too! Thank you so much, Cecelia…we’ll have to work on a plan to get together! Wow! this is so amazing! Sourcream gooseberry pie! Yummy! What amazing treats you get to have when you dedicate time and care to nature.